July 26, 1963 — Syncom 2, the world’s first geosynchronous satellite, is launched from Cape Canaveral, Florida. Geosynchronous satellites appear to remain in one spot over the equator, because they circle the earth exactly once every sidereal day (23 hours 56 minutes). These satellites have been vital to global telecommunications, weather forecasting, and the defense industry. July 27, 1921— At the University of Toronto, Canadian scientists Frederick Banting and Charles Best successfully isolate insulin for the first time. Within a year, diabetes patients began receiving insulin injections, treating what was previously considered a fatal disease. July 27, 1940 — Bugs Bunny premieres on the silver screen in A Wild Hare from Warner Bros, featuring the voice talent of Mel Blanc. Bugs was just one of many famous characters voiced by Blanc before his death in 1989. Others include Mr. Spacely from The Jetsons, Barney Rubble from The Flintstones, Twiki from Buck Rogers, and the voice of Mr. McKenzie in Strange Brew. July 27, 1990 — Zsa Zsa Gabor begins a 3 day jail sentence for slapping a cop. July 27, 1991 — Bryan Adams made number 1 in the U.S. for the first of 7 weeks in 1991, two weeks after hitting the top in the U.K. “(Everything I Do) I Do It for You,” the biggest song of the year, was recorded for the Robin Hood: Prince of Thieves soundtrack. The huge hit was also available on his own album, Waking Up the Neighbours, which kept the hits coming. July 28, 1907 – Earl Silas Tupper, the inventor of Tupperware, is born. Ingenuity is the heart of the American dream. Looking for a cool new pair of cufflinks that reinforce that you’re a handyman? Look no further than these hand made sterling silver Phillips Heads Screw Cufflinks. Available for $80.00 at UncommonGoods. Have you always wanted to play cowboy and brand your own grilled meat? Do you love monogramed towels? If you’ve answered “yes” the all of the above questions, you’ll be in heaven with this Williams-Sonoma Monogrammed Steak Brand. Available with either two or three initials, this personalized iron brand is hand forged in Texas. 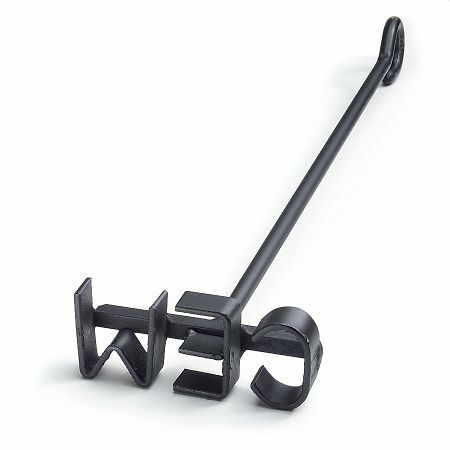 The 11 1/2″ long iron comes with a 14″ high, wall-mount rack for storage. For just $39.95, you’ll be able to leave your mark on all of the steaks you serve at your next BBQ.